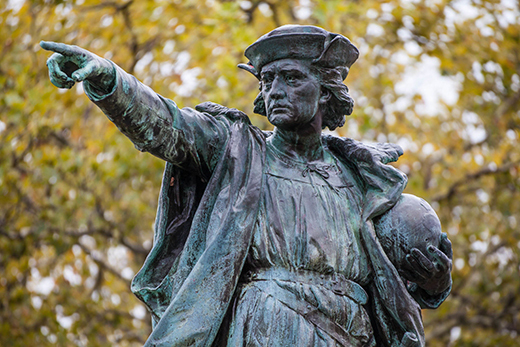 When Christopher Columbus attempted to get to India by sailing west instead of heading east, he was also setting out to prove the Earth is round, right? Wrong. Although this story is still widely repeated in American elementary schools, especially around Columbus Day, Oct. 12, evidence that the Earth is round dates back to the ancient Greeks and was widely known to educated people in the late 15th century. Disputing the "flat Earth hoax" will be the subject of Emory's inaugural Evidence Town Hall, set for Wednesday, Oct. 14, at 7 p.m. in the WoodPEC gymnasium. The event is mandatory for first-year students as part of Emory's new Quality Enhancement Plan (QEP), "The Nature of Evidence: How Do You Know?" The town hall will feature two professors presenting evidence from two different disciplines to show what was known about the shape of the Earth in Columbus' time and before, demonstrating different approaches to answer the same questions and evaluate what constitutes evidence in their fields. The goal of the event is much more than just debunking this particular urban legend, says Tracy Scott, QEP director and a senior lecturer in sociology. Instead, it will serve as an example for a broader understanding of evidence. "In order to be a good producer and consumer of knowledge, you have to understand evidence and how it works," says Scott. "These skills are also critical to being a good citizen, because to understand people you have to understand where their beliefs come from." To counter the idea that Columbus proved the Earth is round, English professor James Morey will discuss evidence of what was already known from ancient literary texts, while Eric Weeks, Samuel Candler Dobbs Professor of Physics, will examine evidence from measurement techniques used in the time period and before. Their presentations will be followed by a question-and-answer session focused on evidence and knowledge, and the discussion will continue in students' orientation groups immediately after the event. "The small-group discussions will try to get students to link back to their own experiences and lives," Scott says. "How do you know what you know? Where does knowledge come from? Did you grow up with things that you now know are urban myths and urban legends?" Attendance is limited to first-year students, their orientation leaders and residence life staff, invited campus leaders and Emory College faculty. A recording of the town hall will be posted on the QEP website so it can be viewed by others. The QEP — an initiative dedicated to improving an aspect of student learning or the environment for student success — is a new requirement for reaccreditation by the Southern Association of Colleges and Schools Commission on Colleges. "The Nature of Evidence: How Do You Know?" was selected as Emory's QEP theme after an extensive, university-wide process. Emory received official approval for its QEP and reaffirmation of its accreditation in January. The Evidence Town Hall is part of one of the three key components of the QEP that launched this year. Others include the introductory component, a series of short videos designed to spark interest in evidence that first-year students watched over the summer before registering for classes; and the classroom component, made up of special evidence-focused first-year seminars, which debuted this year and will expand over the next five. By focusing on first-year students, the QEP aims to give undergraduates a firm foundation in understanding evidence to support the rest of their learning at Emory. "This is meant to be something that infuses the infrastructure and everything else we do," Scott says. "What we are trying to do is to get students to realize that they are learning about evidence in all the different disciplines, even if they don't always use that word, and the way to do that is to keep reinforcing it at every single step."